25 Egyptian teenagers with different cancers at different stages, 35 siblings, volunteers, nurses, oncologists, social workers, and one dance educator from Chicago spend 3 days in a remote complex on a fruit farm in Wadi Natrun, about 2 hours northwest of Cairo. This is a place where you can see the stars at night. 4 people per room. Each room making a new camp family. No cell phones allowed. We board a quiet bus on a Thursday afternoon in Cairo and drive out of town. 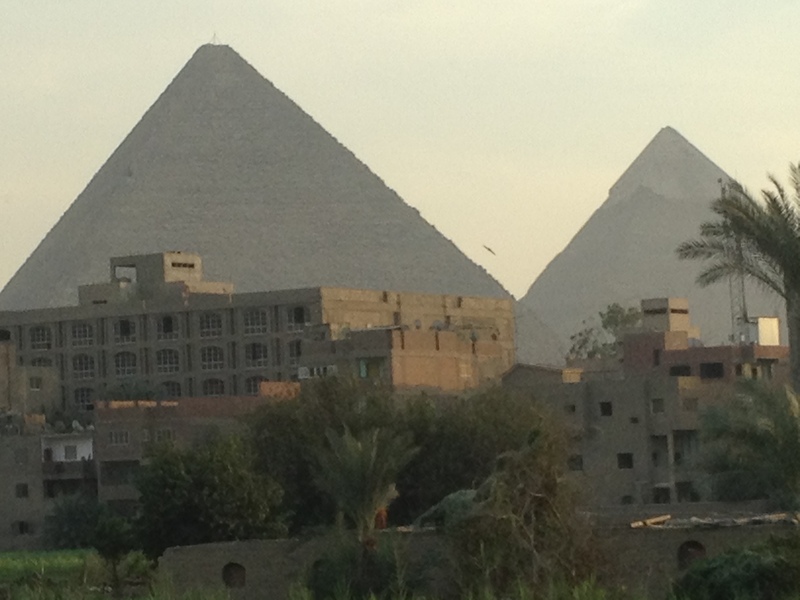 As we pass the great Pyramids of Giza, no one on the bus says a word about them. These great wonders are old news for the children who live here. Pyramids of Giza. A view from the bus. On the road to hope and health. We arrive at the Health and Hope Oasis to applause and a brilliant traditional meal (sort of a sauceless lasagne) followed by rice pudding. 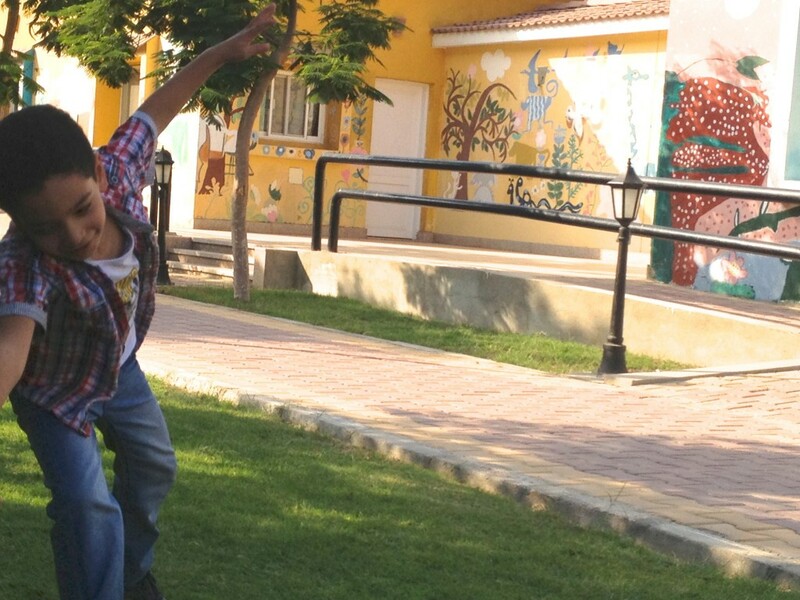 This trip is the first of its kind for the Children’s Cancer Hospital Egypt 57357. The hospital is completely free for the patients, all of them, and so is this experience at the Oasis. The staff hope to hold camps as often as possible throughout the years, but there are too many cancer patients to reach. They’re not sure what will be possible without full-time camp program staff. 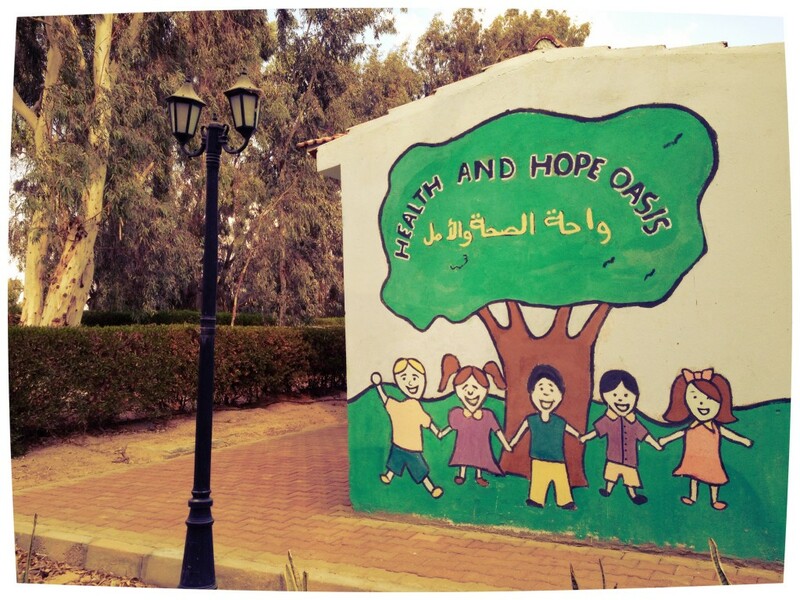 The Oasis facility and farm, from what I understand, were built with help from the Presbyterian church and is run by an organization called Friends of Children With Cancer. Night one, as we are all sitting around waiting for the campfire to come to action, I lead the group in a lively, goofy kids’ game I learned from Bosnia. Later that evening I will have a long discussion with two of the patients about Bosnia, of which they have only heard of vaguely and of which they have many questions. Sticks are found around the grounds and then Patricia, the head of the hospital foundation, approaches the campfire to roast her marshmallow. There is a hush. Then one of the patients asks me why Pat is doing that. I explain the concept of S’mores as the staff bring out biscuit cookies and Cadbury chocolate bars. The next couple hours are pure magic as one-by-one they each delight in their first S’more. The rec room building is opened up around 10:00 pm. Along with air hockey, ping pong, board games and a sound system, it has a full size trampoline with safety net. Inside the building, mind you. Awesome. I was one of those gymnast kids who grew up with a trampoline in my backyard. So I jump right in and start teaching the teens some of the jumps and games from my childhood. After just a few minutes, I was politely instructed that I shouldn’t be bouncing on the trampoline with boys. Almost everything is allowed here at camp except for littering, cell phones, and co-ed trampolining. Later, I go up to a young man who’s always sitting alone and he tells me he “loses all his happiness” when he’s on his chemo treatments. Another volunteer joins us to help with some of the translation and I show them a pic of my bald head from the St. Baldrick’s event. My new friend understands what I did, and why I did it, he pauses with a tear in his eye, says it was one of the most beautiful things he’s seen. Then he gives me a friendship bracelet off his own wrist. And I cry a little. Camp activities include a personal development session with Quest, journaling (during which I share stories about Donna and Shea), art therapy, football, Friday prayers, jewelry making and social times at the canteen where they have fresh guava juice with milk and little cakes. I lead stretches every morning, creative dance sessions every afternoon, as well as guided breathing and movement exploration before bed for those still up at 2:00 am, which is most the campers. I learn new games from the staff, and by the second day, I find them facilitating the games I shared. Love when exchanges work. I hope you like us as well as we like you. These statements call for me to read them twice. I am incredibly humbled. Open hearted for all. These new Egyptian friends understood me in less than 24 hours. I hope they like me as well as I like them. I spend some of the down time learning Arabic from the girls, practicing my numbers, making sure meds are in the right hands and watching how the docs check blood pressure. Other free time is spent coaching one of the staff’s son on cartwheels. He was crashing to the ground and frustrated. We didn’t speak each other’s language, but eventually he was landing all his cartwheels on his feet. Proudly. There are two spontaneous Arabic dance parties on the second day, where I am the student. Belly dance is approved. But I guess there are some arm movements the girls taught me which the staff do not approve of. Still trying to figure that out. And by Day Three, the campers show that their spirit is much stronger than the cancer inside them. Shawn, this makes me so happy! It sounds like for every challenge you face, there’s an amazing presence of love waiting right there in the wings. So glad to know they appreciate you! I love your capacity to have and give fun! I’ve liked it Shawn . But you didn’t mention any hint about our night chats . I loved them alot .